Those of you that follow us closely know that we’re right in the thick of the hustle. This was a thrill in every sense of the word - and arguably the BEST way to see the island! Think the Indiana Jones ride at Disneyland meets Soaring Over California. You’re off-roading with views so magnificent you feel as though you’re flying! The East End Adventure team takes groups daily on a Hummer tour around Catalina. You scale mountains you didn’t even know you could climb! We saw wildlife, stunning viewpoints, and at one point we could even see both sides of the island at once! This might possibly be the best-kept secret of Catalina Island. The famous Mt. Ada (formerly the Wrigley mansion) is known for their historic B&B and picture-perfect views of the island… but what many people don’t know, is that they offer a 3-course lunch that the public can enjoy! Included in the price is beer, wine, and the most epic view of Catalina. Not to mention the food is delicious! Reservations are required, so keep that in mind as you plan your weekend. We’ll be honest, Alli did everything she could to try and get out of this. We’re both afraid of heights, and the aerial adventure seemed absolutely daunting. But, being the adventurers that we are, we did it. And we survived. And it might just be our favorite memory of the trip!! The adventure staff encouraged us through every challenge, and towards the end we REALLY felt like we’d bonded with them. We ended up doing 3 courses, two of which were level 2 (out of 3)! After our Aerial Adventure tour, nothing sounded better than a morning at the spa! The Island Spa Catalina is brand new, located inside the historic El Encanto building and has luxurious lounge spaces, soaking pools, and a vista deck where you can take in the view of the coast. We indulged in a couples massage and then spoiled ourselves with champagne and snacks while enjoying the views. It was one of our highlights of the trip! Raise your hand if you’ve traveled to Catalina Island several times, but have never gone inside the world-famous Casino! Us too! This charming tour is a MUST in our book, and here’s why. It’s led by a man named "Frankie from Avalon" (look him up, he’s famous on Trip Advisor! ), and he might very well be the most precious man we’ve ever met. Frankie grew up on the island and created this tour himself. His knowledge of the casino’s history, the musicians and celebrities that have graced the stage, the events that have taken place, etc., is incredible. After he’s whisked you around the casino, through the dressing rooms, and hidden passageways, he’ll bring you to the dance floor on the top level. There you’re served wine and given the chance to learn to swing dance with him! Getting There: Hop aboard the Catalina Express. With ports in Long Beach, San Pedro, and Dana Point, there are plenty of options for all SoCal natives. It takes about 60 minutes, is a smooth ride, and beautiful views at sunset. We opted to spend the extra $15 to upgrade to the Commodore's Lounge, where you have priority boarding, more comfortable seating, and a complimentary beverage with packaged snacks. It was a great experience! Stay: Book a room at the Pavilion Hotel - you won’t regret it. The hotel has comfortable rooms, a delicious complimentary hot breakfast, and prime location. The rooms face an expertly manicured tropical garden that will instantly set your watch to island time (hehe). Spend the afternoon relaxing in a chaise lounge, watch the sun set over the ocean during their complimentary wine and cheese reception each day, or sit around the fire pit and make new friends. Our Favorite Eats: Mt. Ada, Avalon Grille, Descanso Beach Club, the Lobster Trap (local favorite! ), and Blue Water Grill. All that to say, Catalina is the real deal. The Pavilion is rejuvenating, the food is delicious, and there are all kinds of adventures to be had. We will be sure to hustle back. 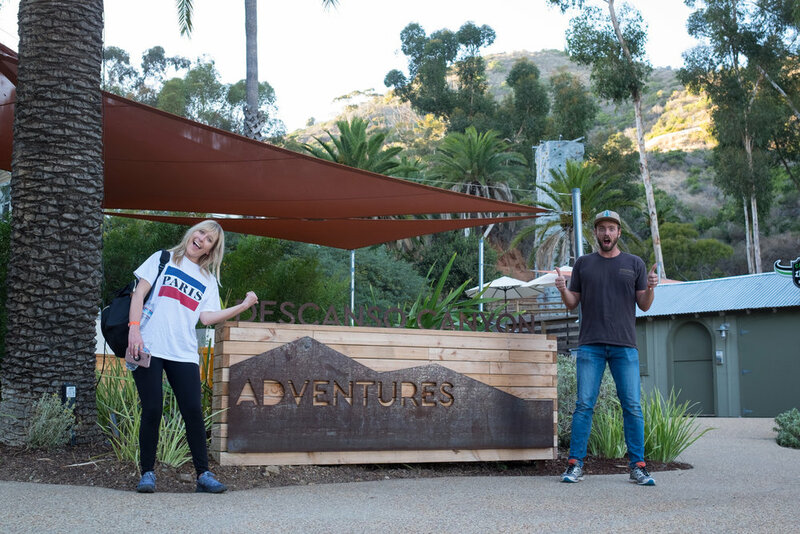 Thank you to Visit Catalina Island for sponsoring this post!